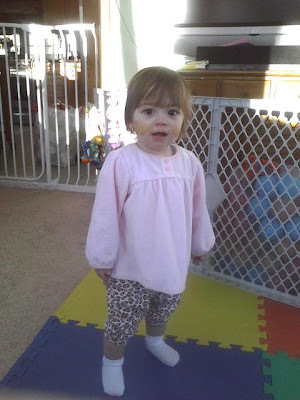 Nanny April sent me this photo of Penny modeling an outfit her great-grandmother Mimi gave her. When I looked at it I nearly fell off my work chair. I mean - talk about the spitting image of her Grammy. My mom will kill me for this photo taken in 1992 but it is the only one I could quickly find. I feel a little badly that Penny has a haircut from the early 90s but there is only so much you can do with bone straight hair that is still coming in. Thanks for the comment! You asked about my wife's concerns with her role and the possible guilt she'll face. I can only say that at present it's an unknown quantity, but I'm sure she'll experience it, and probably rather strongly at that. She is not quite as enamored with her job as you are with yours, so I have a feeling that this will complicate issues somewhat. She does derive a certain degree of satisfaction from it because she is quite good at it and it does bring in a fair income. Money isn't all that great a motivator, though...especially when you're being paid far less than you should be! That should be rectified soon, after which I suspect her satisfaction will go up enough to make the inevitable guilt just a little more livable. I have a good idea of her thoughts on this issue from discussions we've had recently. Call it a battle of the guilts: either she works this job and brings in a pretty solid income along with outstanding medical benefits for all of us while feeling substantial guilt over not spending enough time with her boys, or she spends tons of time with the boys but all the financial strain falls on my (presently less marketable, lower income) shoulders and she feels substantial guilt over not providing fiscally. The first one wins out because she figures that, between the two of us, we can supply them with an infinite supply of love whenever there's a moment's free time, but money will never flow so freely. I know we both expect a greater degree of flexibility in the future, and I think this will help lessen the pangs to some degree. I intend to head off to law school in a couple years, after which time she will likely take a huge pay cut and move on to being a part-time college professor and full time mom. I'll be honest with you, though: if I know my wife as well as I think I do, she'll be chomping at the bit to get back to outside-the-home work in a year's time. I don't think the SAHM role would satisfy her for very long, even if the guilt were not a factor. She'd have way more than enough to do, I know, but I could very easily see her tossing aside a load of laundry, handing me her SAHM resignation, and marching out the door in business professional dress with resume in hand. I'll support her no matter what, though...just so long as I still get to help decorate/design and cook on the weekends! Like looking into a mirror a certain amount of time ago :-) You need to dig up photos of you and me at that age...I think we even had the same haircut! so, does mommy have a matching pair of leopard pants? 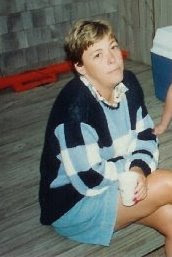 oh goodness, please don't tell your mom but the early 90s is pretty much how i remember her :) i moved in 94!